Chil­dren And Resi­dents Enrich­ment Program, C.A.R.E., is our inter-generational activities pro­gram where Seniors from Santa Tere­sita Manor and Good Shepherd Cottage engage with the children of Hayden Child Care Center for crafts, fine arts, and other edu­ca­tional activ­i­ties. These help to pro­mote greater kind­ness and com­pas­sion between gen­er­a­tions. 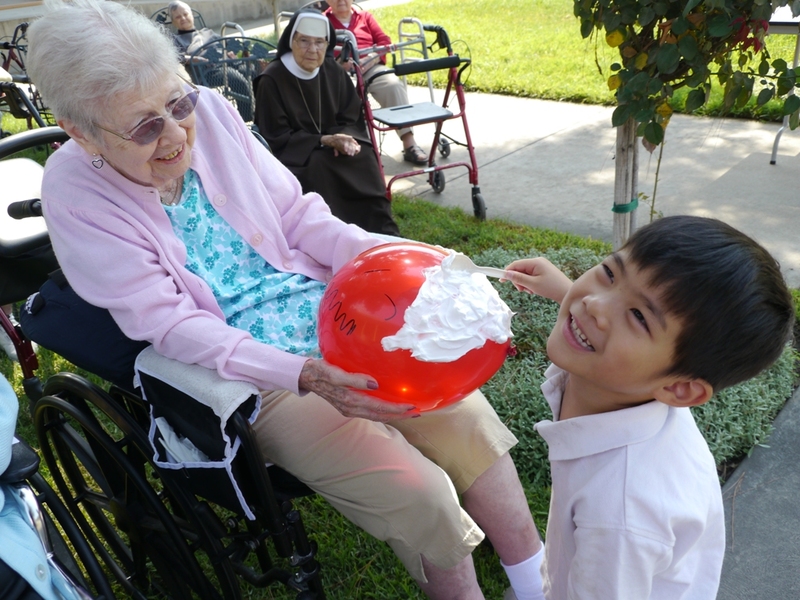 It is a source of joy, fun, and exuberance for both the young and young at heart! Both our child care center and our living centers for our senior residents are within walking distance of one another. Therefore, the children are able to come and visit the “grandmas and grandpas” regularly. Each class at Hayden rotates days to visit, which means that there are children with the “grandmas and grandpas” almost every school day! Through these healthy, positive interactions, the students and residents are given opportunities to grow spiritually, socially, and academically. To read an article about our Inter-generational Activities, please click here.